Dell D P/N 2664E (6/V40H-3P) DELL LATITUDE SERIES CMOS Battery Dell Latitude CP, Dell Latitude CPt, Dell Latitude CPi, Dell Latitude CPx, Dell Latitude CS, Dell Latitude CSx etc. Type: Nickel Metal Hydride (Ni-MH). Voltage: 7.2V. Capacity: 40 mAh. Length of Flex: 80 mm. Height: 6 mm. Length: 70 mm. Width: 11 mm. Functional replacement for: Dell D P/N 2664E, 2264E, 02664E, Varta 6/V40H, Varta 6/V30H RAM Battery. Compatible Models: Dell Latitude C800, C810, C840, Dell Latitude CPt, Dell Latitude CPi, Dell Latitude CPx, Dell Latitude CPiR and others. Also Dell Precision Workstation M40, Dell Precision M50, Dell Latitude C800, Dell Latitude C810, Dell Inspiron 3700, Dell Inspiron 3800, Dell Inspiron 8000, Dell Inspiron 8100, Dell Inspiron 8200, and others. six Varta V40H NiMH cells in a row. 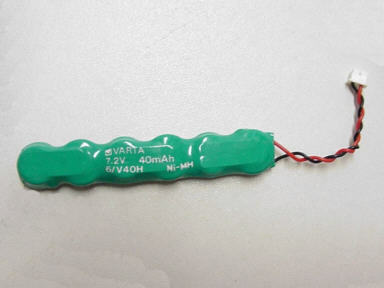 shrink wrap marked "7.2V 40mAh Ni-MH, 6/V 40H, D P/N 2664E".